This is a little info about the new features in the V5 TuneBoy maps. One feature is the throttle map switching, this adds two extra power modes. The standard 1299 maps have restricted throttle opening in the first few gears. The TuneBoy map adds two unrestricted throttle tables. The first of these alternate throttle tables has full throttle available in all gears. The second alternate provides a more aggressive power delivery, this throttle map stops the torque from falling off as RPM increases. To switch throttle maps you do the following. Turn ignition on but don't start motor. Turn throttle fully open and press the menu up button. The RPM display will show 5000 for the standard Ducati throttle mapping, 6000 for the first alternate mapping and 7000 for the second alternate mapping. The alternate throttle mappings are only used in the high power mode, the low power and wet modes are unchanged. The ECU remembers the throttle mapping you have selected and will use this until you change to a different mapping. The next feature is a new tuning process that allows you to tune the low throttle area using the bikes standard narrow-band O2 sensors. The narrow-band sensors are only accurate at 14.7/1 A/F ratio; this is no use if you want to tune the motor to run at 13.2/1 but we now have a way around this. The process is to use the narrow-band sensors to correct the low throttle area to run at 14.7/1. Once this area has been corrected to 14.7/1 we can use a % adjustment to bring the mixture down to 13.2/1. 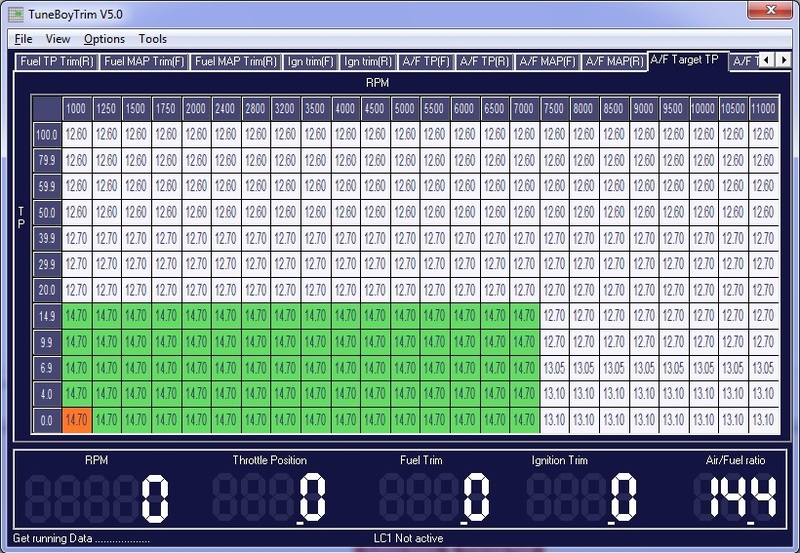 Start the latest TuneBoyTrim program and set the AF target TP screen so it has an area showing 14.70 (See image below). No adjustments will be made unless the target is exactly 14.70. Press the 'T' key to show the target screen and select "NarrowBand0-1.2v" as the O2 sensor type. Start the motor and let it warm up. Now press the 'a' key on the keyboard; this will turn on the auto-tune mode and you will see a dot next to "Auto tune enabled" in the target window. If you don't see the dot press the 'a' again as sometimes it does not turn on first time. Once the A/F crosses 14.7/1 four times the TuneBoyTrim program will mark the point in the table as being correct. The colour of the A/F value will change to yellow. If you put the laptop in your backpack and ride the bike you should be able to get most of the low throttle area to have yellow squares. It is a good idea to mark the throttle points on the throttle grip with correction fluid (Liquid Paper) and a pen. Using this method you know how far to turn the throttle so you collect good data. To increase the hit rate for the A/F values you can adjust the size of the green square and decrease the sample count. The size of the green square is adjusted by going to the "Tools" and "Process log file". On this screen you can change the "RPM and throttle zone %" to a larger number, something like 40 or 45. This will collect more data. You can also reduce the "Stable throttle for number of samples" to make it collect data sooner. Once you change these values just click "Cancel" on the progress log screen. The values will still be changed in the target screen. A good process would be to increase the target zone to 45 to "rough tune"; this should get the values close. Once you are happy with the number of cells that are turning yellow you can move to the next stage. Save the trim file with a new name so you keep a copy of the trims required to get 14.7/1. In the new trim file you can change the AF Target TP values back so they range from around 13.2 at the bottom and get richer as the throttle increases. Now you can select the cells in the "A/F TP" (F) and (R) tables and press the 'c' key. This will calculate the trim required to move the A/F from the 14.7 value to the new value in the target screen. If you need to retune the low throttle area you should use the trim file you saved before doing this final correction. Keep in mind that any cells that did not turn yellow could become too rich if you include them when you do the final correction. This is why it is better to take your time and get as many cells to turn yellow as you can. I hope to have an iPhone app that can do the adjustment while riding. This will make it easy to see throttle position and should speed up the process. he knows quite a bit more than you do. this is a very clever workaround. Wayne, can you please elaborate on this? What is the maximum throttle opening for the Ducati Engine High tune in 1st, 2nd, 3rd gear, etc? Can you roughly advise how this translates to % Hp reduction? Wayne, if the first alternate gives unrestricted throttle opening, then how does this second alternate provide more aggressive power delivery? Is it related to the response speed of the throttle, or something else? Also, how does this "throttle map stops the torque from falling off as RPM increases"? Are you talking about part/increasing throttle scenario, or are you talking about WOT? The engine has a secondary air system which adds fresh air in the outlet port of each cylinder head. That means the A/F ratio is changed (compared to the A/F ratio in the cylinder) in the exhaust before reaching the lambda sensors. Would that not mean that the actual A/F ratio in the cylinder is richer anyway than 14.7:1, but is made more lean (to 14.7:1) by adding air to enable the cats to convert with max. efficency? Or is this system active only in warm-up to quicken up the warming of the cats for lower emissions in the testing cycle? Last edited by jogy; Jul 6th 2015 at 12:20 AM. A narrow band O2 sensor is more accurate at 14.7/1 than a wide band O2 sensor. This graph shows the sensor voltage vs A/F for a narrow band sensor. I should have a 1299S with full Akra on the dyno next week. I will do the tune up to 20% throttle using the narrow band sensors as outlined above. Once this is done I will fit the wideband sensors and test the result. I expect the narrow band tuning to give a flat A/F line when the wideband is fitted. I will fit the wideband O2 sensors and do a base run before and after the narrow band tune, this will show how accurate this method of tuning is. I have found that the big difference from bike to bike is in the low throttle area, this is where production tolerance makes the biggest difference. If we can custom tune the low throttle area using the existing narrow band sensors it is a good thing. If people don't like this method they don't need to use it. The TuneBoy map file closes the secondary air injection so that tuners don't need to block off the SAI. In first gear the 1299S hits 87% throttle at 6500RPM then drops back to 70% throttle. In second it drops back to 75% throttle. I have not tested this to see what that gives as a power curve. I will test this by loading the first gear throttle table into the fourth gear position for a power run. From a rider point of view the actual throttle position is not important, what is important is the throttle grip position and the power through the rev range when the rider holds a steady grip position. Changing power delivery without rider input is the thing a rider feels, this could be a dip in power or a rush of power. Riders all like to think they spend a lot of time at high throttle, this is not the case. Just look at the MotoGP riders. The feel of the bike at part throttle is everything when it comes to a road bike. Another thing people should try is turning off the fuel cut. Go to the "Config Options" and put a tick in "FCE", this will stop the ECU from cutting all fuel on deceleration. The standard ECU program cuts fuel between 5500RPM and 2000RPM when the throttle is fully closed, this causes a jerky throttle feel as you start to turn the throttle and the ECU turns fuel back on. The "FCE" flag stops the ECU from turning the fuel off. This can be changed without having to reflash the ECU. Wayne, after you have done the 1299S with full akra dyno, would appreciate the updated files. Doesn't a Rapid Bike do this in real time? I don't know if widebands have gotten better over the past ten years, but real time autotuning, when I did it, has its weaknesses.